Landscaping with water makes a statement unparalleled by any other landscape feature. This video will take you on a journey showing you example after beautiful example of the different possibilities available for incorporating water into your landscape. Customized for TJB-INC, the DVD includes info and pictures from our company's portfolio. 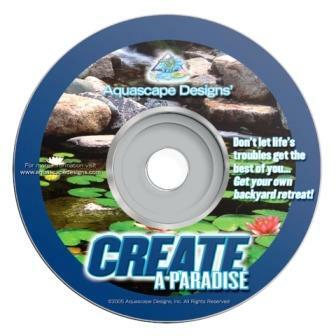 View the slideshows and gather ideas for your backyard water feature. Whether it is the ponds or the landscaping, the beautiful images will stir your imagination and created juices! We also include a current Aquascape Catalog plus additional pond information to help you understand the wonderful world of Water Gardens!